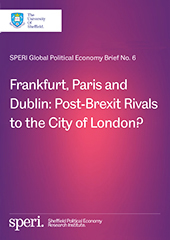 Two new SPERI Global Political Economy Briefs are published today. The first Brief, Frankfurt, Paris and Dublin: Post-Brexit Rivals to the City of London? assesses the strategic positioning of alternative financial centres in the aftermath of Brexit. It shows how three major rivals to the City are organising to attract ‘low hanging fruit’ from London. 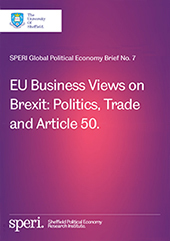 The second brief, EU Business Views on Brexit: Politics, Trade and Article 50 analyses the positions of key employer organisations within Germany, France and Ireland in relation to Brexit and their trading relationship with the UK. Authored by Dr Scott Lavery and other SPERI researchers, the two briefings draw on a review of over 300 German, French and English language policy documents, policy papers and press briefings between the EU referendum in June 2016 and March 2017. Although it is highly unlikely that alternative financial centres in the EU will replace the City of London as Europe’s premier financial centre, certain financial market activities are potentially vulnerable to relocation after Brexit. Frankfurt, Paris and Dublin have all identified euro-denominated clearing, fintech, asset management and financial regulation as ‘low hanging fruit’ which could be relocated after Brexit. Private and public sector actors within these alternative financial centres have taken concrete steps in order to benefit from Brexit. France has been particularly aggressive, making changes to its tax code and advancing programmes designed to draw in financial sector investment in the wake of Brexit. Additionally, key actors in all three alternative financial centres are using Brexit as leverage to to agitate for pro-business tax cuts and regulatory reforms both domestically and at the EU level. The body representing Paris’ financial sector, for example, has called for a “competitiveness and attractiveness shock” to the French economy in light of Brexit, organised around corporation tax cuts and reductions in taxes on bankers’ pay. The EU Business Views on Brexit Brief identifies the five export sectors across Germany, France and Ireland which are most exposed to a worsening in the terms of trade with the UK. There is evidence that businesses within these sectors – and business organisations more broadly are seeking to retain as close a trading relationship with the UK as is possible. There is little appetite for the UK to be ‘punished’ for its decision to leave the EU lest this impacts negatively on trade surpluses with the UK. However, EU business groups are also clear that the UK should not receive ‘special treatment’ which compromises the integrity of the Single Market. German employer organisations in particular are concerned that excessive concessions to the UK could precipitate further instability within the EU. Frankfurt, Paris and Dublin: Post-Brexit Rivals to the City of London?